The loss of the beautiful Cathedral of Notre-Dame has touched all of us deeply. Those of us who have had the privilege of visiting this iconic cathedral marvel at its Gothic architecture. I have watched people come into the cathedral and as soon as they adjust to the semi-darkness, their eyes follow the high columns heavenward. This is, of course, the very point of Gothic architecture; it speaks of transcendence, inviting us to look up beyond ourselves to God in humble worship. As has been reported on the news, this cathedral has weathered political revolutions and two World Wars. When my wife and I visited it, we walked up to the altar, recalling that during the French Revolution the statue of Mary was replaced with a woman called “the goddess of reason,” and it was here that Napoleon crowned himself emperor in the presence of Pope Pius VIII. Napoleon crowned himself signifying that his authority was not derived from the church; indeed, the church would be subject to the state and not the other way around as was true in previous centuries. Construction on the cathedral began in 1163, during a time when the only available worldview was that of Christianity—specifically Catholicism. It was built before the Reformation and the Enlightenment, which broke the Catholic Church’s monopoly over the consciences of the masses who longed for religious freedom. What burned on Monday night? First, an architectural wonder. The huge cathedral’s stained-glass windows were damaged, as well a centuries-old organ. Also, many artifacts and paintings were destroyed (at the time of this writing the extent of the damage inside the cathedral is still being assessed). Second, what burned was a symbol of French identity. The cathedral, originally built as a place for worship had, after the French Revolution and the Napoleonic wars, stood as a symbol of France and its religious and political history. Indeed, the cathedral is not even owned by the church, but by the state. 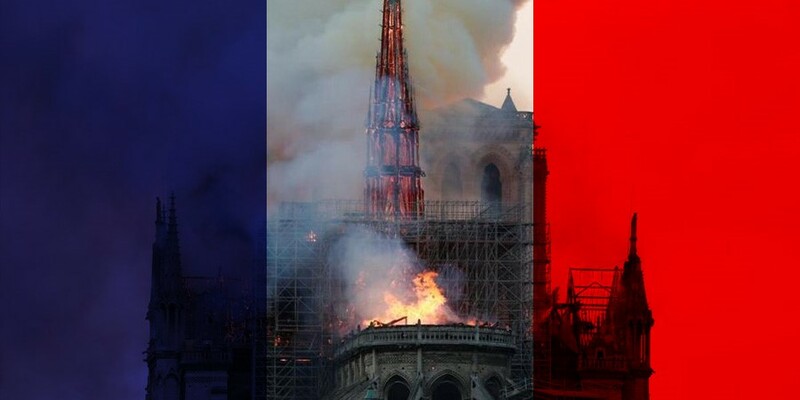 Something else burned as well: the cathedral’s iconic spire with its cross at the very top as a reminder of Jesus’ death on behalf of us as helpless sinners. Onlookers gasped as the burning spire, which for over a century pointed heavenward, fell piece by piece into the massive structure. The news reported that a crown of thorns, purportedly the very crown placed on Jesus’s head, was salvaged. Let us pray that the message of the cross as explained in the New Testament will also be rescued from the flames of spiritual apathy. One of the important lessons of tragedy is that it forces us to think soberly of what matters most. The terrible fire in Paris reminds us that a greater fire is on its way. “But the day of the Lord will come like a thief, and then the heavens will pass away with a roar, and the heavenly bodies will be burned up and dissolved, and the earth and the works that are done on it will be exposed” (2 Peter 3:10). Only that which is eternal can escape the fire that is yet to come.